Julien: When I saw that kid having his fit, shaking all over... I saw myself when my dad hit me. All I got from him was beatings. I wanted to be a doctor to treat him or to treat myself, I don't know. Or to be a better doctor than ours who thought I bruised myself playing. 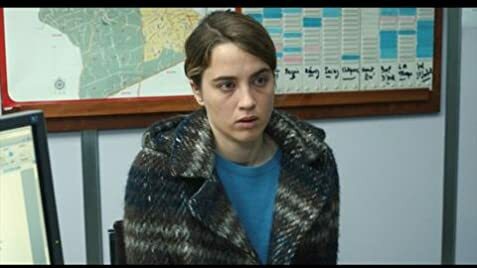 While The Unknown Girl, the latest film by Jean-Pierre and Luc Dardenne ("Two Days, One Night"), is suggestive of social and political issues such as immigration, unemployment, and economic imbalance, its main concern is with moral character, accountability, and spiritual redemption. Like many other films of the Dardenne Brothers, it is simple, natural, and direct, without using a musical background or resorting to sentimentality. 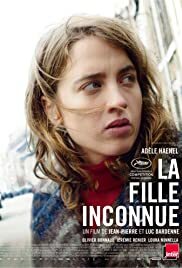 Consistent with recent exceptional performances from established actresses such as Cecile de France in The Kid With a Bike and Marion Cotillard in Two Days, One Night, Adele Haenel ("Love at First Flight") is transfixing as Dr. Jenny Davin, a young general practitioner in Saraing, Belgium whose quiet strength, professionalism, and fierce determination dominate the film and make it a worthy addition to the two-time Palme d'Or winners' oeuvre. Shot by cinematographer Alain Marcoen ("Two Days, One Night"), the film begins at a small clinic where Jenny has been filling in for the retiring Dr. Habran (Yves Larec) but must soon decide whether to accept a more lucrative position out of town. When a young boy has convulsions, Jenny deal with it promptly but later calls out her intern,, Julien (Olivier Bonnaud) for letting his emotions get the better of him, a dressing down that causes him to rethink whether or not he wants to be a doctor, though she later confesses to him that she was being high-handed. Her next admonition to Julien, however, has much more serious consequences. When they hear an after-hours buzzing on the intercom, she instructs him to ignore it, telling the young intern that he cannot let patients rule him. When a young African woman is found dead on the opposite side of the freeway by the river Meuse, however, Jenny is riddled with guilt. It is soon clear that the deceased woman was the same person who knocked on their door late at night, yet without any identification papers, discovering her identity and the cause of her death is a challenge which becomes the central focus of the film. Though it deals with a possible criminal investigation, it is less of a "whodunit" than an exploration of the many ways in which people deal with feelings of guilt. Realizing that if she had answered the ring, the young woman might still be alive, Jenny takes it upon herself to conduct a solo investigation. Hoping to discover the victim's name and find anyone who knew her in order to give her a proper burial, Jenny walks around the town, talking to adults and children who may have seen the woman, showing them her photo and reassuring them that any information they provide will be held in confidence. Though most are in denial and refuse to cooperate, Jenny is able to pick up important signals, especially in an interview with a teenager (Louka Minneli) when his accelerated pulse rate indicates that he may not be telling the truth. The Unknown Girl is mostly muted with little variation in tone, but there are moments of joy when two young male patients sing a lovely song they wrote for Jenny, and when an elderly woman throws a gift of a panettone out the window into Jenny's waiting arms. It also touches on the spiritual when a man asks Jenny, "Why should I screw up my life if she's already dead?" and Jenny replies, "Because, if she were dead, she wouldn't be on our minds." While a too-neat resolution and a lack of the element of surprise keep the film from being in the top rank of the Dardennes' works, its message that healing can only begin when there is a willingness to communicate and to be responsible for one's actions is as good as any that have been delivered in previous films.